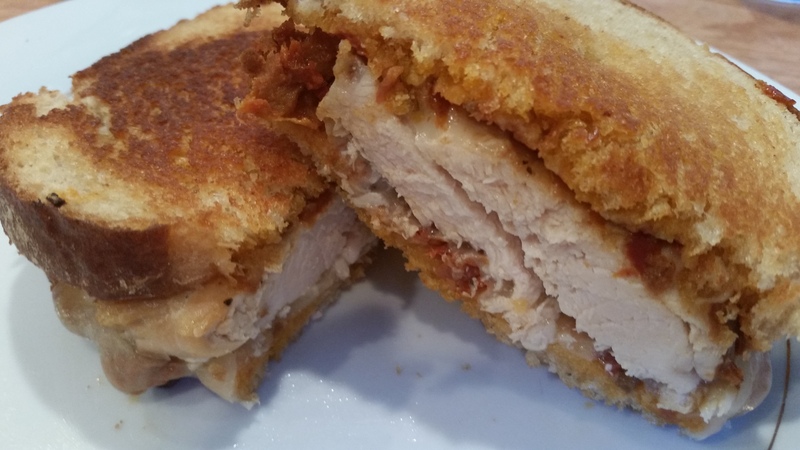 Cook Once and Eat Twice: Grilled Cheese and Chicken with Sun-Dried Tomato Pesto – What's for Dinner Moms? Sandwiches can be a meal saver on a busy weeknight. My kids always frowned when I would mention sandwiches for dinner. Then I realized that they were thinking plain white bread and cold cut sandwiches. That is boring. I found out if I spiced up ordinary sandwiches with pestos, seasoned mayonnaise, or even mustards the kids tended to think they were fancy and would try them. Yes, I have foodie kids. This was a hit! The family loves the jarred sun-dried tomato pesto I used. This can be homemade but sometimes the jarred pestos can come in handy on busy nights. I try to have a jar of DelAllo (I receive no compensation from this – we just really like this) sun-dried tomato pesto with basil and cheese on hand in my pantry. Keeping the temperature low on the stove top once again gets that crispy outer crust on the sandwich while melting the cheese perfectly. Serve this with soup, salad, or a fruit side to complete the meal. TIP: This can easily be a cook once, eat twice meal! Pan fry a couple extra chicken breasts while you are making the sandwiches and you can use the leftover chicken in a super simple dish tomorrow with Buffalo Chicken Poutine or any casserole that has pre-cooked chicken! In a large skillet over medium heat warm the olive oil. Add well salted and peppered chicken breasts to the pan. Cook 4-6 minutes each side (depending on thickness of breasts) until golden brown. 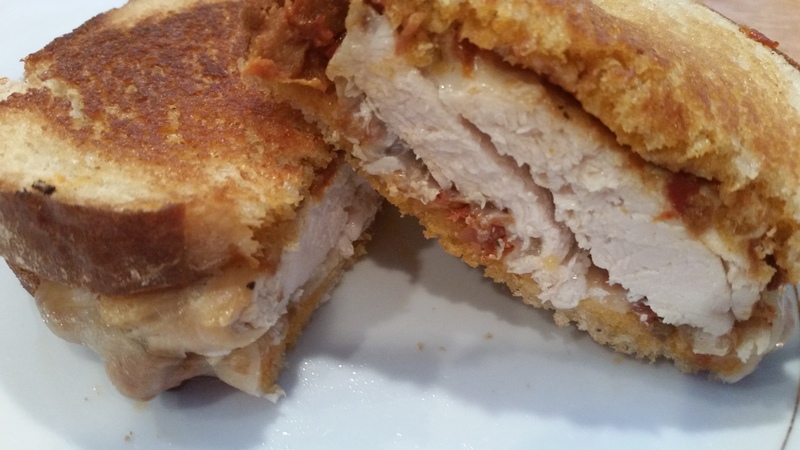 Remove chicken from pan and slice into 4 pieces (one for each sandwich). Spread prepared sun-dried tomato pesto on bread, top with some cheese, top with chicken, more cheese and then the second slice of bread spread with pesto. Butter the outside top of the bread and flip sandwich into pan so buttered bread is down. Cook on medium-low until bread has browned on the bottom. Spread butter on the face up bread and carefully flip sandwich so buttered side is down in the pan. Cook until second side is browned. You want it to cook low and slow to get that nicely browned, crispy bread. Repeat with each sandwich. Remove sandwich from pan. Cut in half and serve warm. A great sandwich idea, Marci. I have shared this on Facebook. Yummy! I agree with Robie, that’s a really good idea, Marci! I will definitely be trying this! Looks amazing!! Hi! Thank you for stopping by and reading my blog! yumm this sounds amazing Marci! I have never tried sun dried tomato pesto! Thank you. It has taken quite a bit of work to get them to that point. My son was a beige food and texture aversion kid but he has come a long way. I would say you’re doing a pretty great job!